Synopsis: Joe Coughlin is nineteen when he meets Emma Gould. A small-time thief in 1920s Boston, he is told to cuff her while his accomplices raid the casino she works for. But Joe falls in love with Emma – and his life changes for ever. 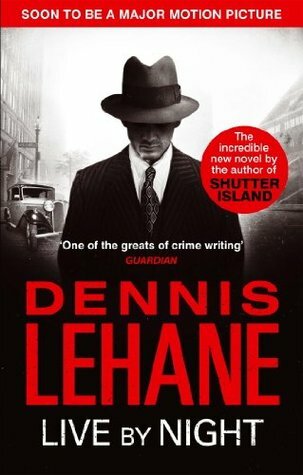 Review: Live By Night was an important book for Dennis Lehane. His tenth novel, written in 2012, it was both a follow-up (but not a direct sequel) to his 2008 epic The Given Day and penned around the time his TV writing career was really taking off. His work on HBO’s worldwide hit The Wire had earned him a call-up to the writing team of the highly-acclaimed Boardwalk Empire, another HBO success. There were questions, from fans and critics alike, that Live By Night would therefore answer. Did Lehane still have the taste, and passion, for a powerful literary work? Did he still have the time to produce one? Would Live By Night (with its 1920s east coast gangster setting – the same backdrop as Boardwalk) be just a simple extension of the themes explored in that show? Since making his commercial breakthrough in the early 1990s, hailed as part of a trio of new-age American crime writers with George Pelecanos and Michael Connelly, Lehane’s literary career has soared. His first five books featured quirky detective duo Patrick Kenzie and Angela Gennaro in modern-day Boston, but his next effort, Mystic River, catapulted him into the major leagues, the novel being turned into a film starring Sean Penn and directed by Clint Eastwood. Psychological thriller Shutter Island followed (also adapted into a film, starring Leonardo DiCaprio and directed by Martin Scorsese). The Given Day was his first foray into historical fiction, exploring the 1919 Boston Police Strike and its dramatic aftermath, and my initial impression of Live By Night was that Lehane had once again successfully employed his gloriously muscular, confident prose that dominated his other books. We’re thrust into the 1920s; prohibition is rife, opening the floodgates for bootleggers, gangsters and corrupt police to line their pockets. Police captain’s son Joe Coughlin, just 19, has a taste for living on the criminal side of the moral line, and an even bigger taste for Emma Gould, the girlfriend of veteran gangster Albert White. Joe and Emma begin an affair that is as clandestine as it is passionate, and it’s here, in the book’s early stages, where Lehane’s engrossing style leaps from the page. The dialogue between Joe and Emma is as witty and sharp to draw comparisons with the Coen brothers’ script for Miller’s Crossing, while Lehane expertly paints a vivid picture of the age but never once allows the pace of the story to slip into second place. History is merely a backdrop; Lehane’s extensive research doesn’t blunt the sweeping narrative, allowing the evocative characters and the crisp dialogue to bring the book to life. We don’t have to wait long for something to go wrong. Joe’s outlaw instincts draw him and a small gang into a bank robbery. But their escape plan is botched, and Joe is forced to go on the run from the police. He goes back for Emma in the hope of seeing them elope together, but this is tough, merciless noir and Joe’s plans – and more literally his beaten body – end up in the gutter before he’s arrested. Serving a lengthy prison sentence, we experience Joe’s intense struggle for survival in a desperate, cut-throat environment. With Lehane’s skill, this is a haunting passage within the book and we’re totally convinced by the authenticity of rival mobbed-up inmates and their internal war, and Joe’s dilemma of which side to pick in order to survive. But despite the prose being laced with Lehane’s usual stark, atmospheric edge, this section of the book for me slightly disappoints. The problem with widespread narratives that cover a large part of the main protagonist’s life (we’re living Joe’s epic journey from a cheeky 19-year-old to one of the USA’s most dominant and influential gangsters) is that, in crime fiction, these often encompass prison time. Joe is sentenced to five years and serves more than two, but the necessity to move on to his career after prison results in this stage of his life feeling a tad rushed. The format, to avoid the book ending up with an absurd word count, drives the narrative here. Even though we get plenty of value in the relatively short prison sequence and experience Joe’s troubles and anguish close up, it doesn’t feel like we’ve lived over two long hard years behind bars with him by the time he gets out. To Joe, the bleak brutality of those years would have felt like half a lifetime. The structure of the book’s scope works against the author here, but Lehane isn’t the first crime writer to find it tough to effectively convey a long prison sentence on their main character within a small portion of a novel, however he comes closer than most to cracking it. Having been forced to link up with a dominant crime boss to survive prison, Joe is sent by the mob to Florida on his release to run the rum-smuggling syndicate they have going. He flourishes in his seniority, making the mob – and himself – a huge amount of money. He meets a girl too, a member of the Cuban émigré community whose world he immerses himself in, and his personal life begins to give him the inner equilibrium he perhaps deserves but, once again, this is noir – and heartbreak is never far away. Live By Night fully merits its tour-de-force marketing tag. It’s another success for Lehane, earning virtuous distinction from his mounting TV work, and for us readers it’s another chance to enjoy his graceful, sassy prose set within a deeply moving novel.